Time: The video is 11:37. The workout will take longer. 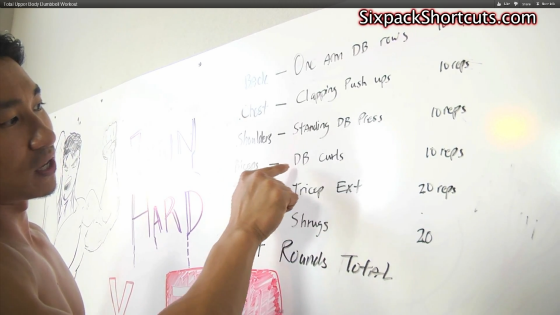 Mike put together a great upper-body workout in this video. He shows you one round of the set and you are to complete 4 rounds total. Be sure to watch the video for Mike's tips and to see proper form. Be sure to use the full range of motion in each exercise. It doesn't always look to me like Mike is doing that but maybe what he's doing is his personal full range, so it's hard to judge. If you can't do clapping push-ups (I can't), then do regular push-ups, or push-ups from your knees. Watch your form on push-ups, most people don't do them right. Your wrists should be directly under your shoulders and you should lead with your chest, not your head. This workout is not a race, watch your form and do the exercises correctly. I used 5 lb dumbbells throughout the workout. I could have used 8 lbs for both the rows and the curls, the 5 lb dumbbells just weren't heavy enough. Next time I'll be sure to up my weight for those exercises. Full workout: Complete 4 rounds.